I’ve been inspired by so many bloggers recently that I’ve finally decided to bite the bullet today & redo my blog. Just simplify it, really. Before I can do that, I have to update my Etsy shop, Zazzle & my website. Whew! I may not get it all done today, but it’s a start. I’ve also been inspired by the linky parties this week. There are loads of fun spring topiaries people are making – some with moss, some with easter eggs. These are just paintings I’ve done and would like to share. 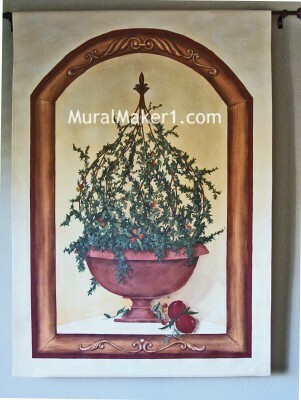 This is the very first wall painting I ever did. Very simple, but fun. Back then, I didn’t know to paint over outlets. What was I thinking? It really detracts from the painting! This was for my sister-in-law, before anyone actually paid me for my work. 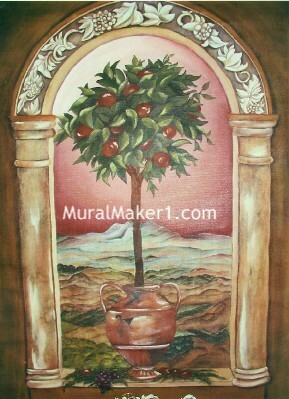 It’s on a canvas wall hanging & I troweled on tinted joint compound to give it a fresco look. I still love the way it peels off in places. One of my very first commissioned pieces. 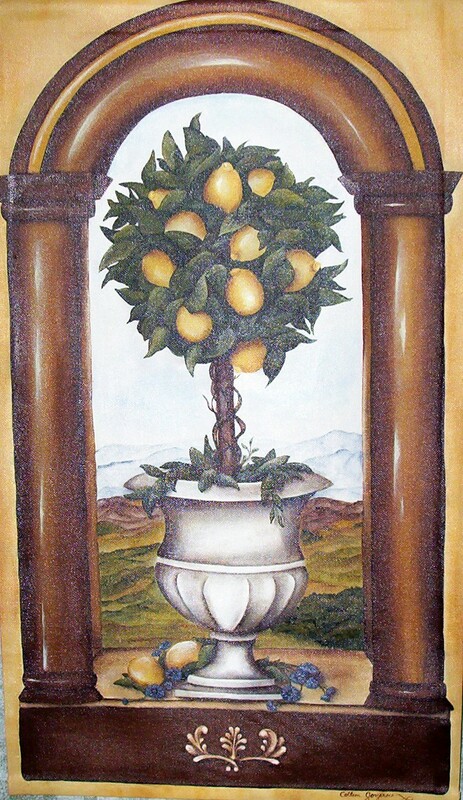 She had some greeting cards, saw my pear & pomegranate topiary in my house and asked me to paint this. Wish I had better pictures, but this was waaay before digital cameras! This was a take-off on the one before. I had it all painted originally with a blue sky. Then this gal came over and said, ‘try a pink sky!’ Not sure I ever liked the pink, but I just left it. After that, I learned not to listen to people’s advice, unless they are the client. I was apparently into a groove with fruit topiaries in those days. I still have this one and need to put it in my Etsy shop. Another commissioned piece. I like the different shape of this topiary. We did this just to fill in the space in her dining room. That’s what is so fun about painting for clients – you can make it the size that’s best for their room. This is in a little niche in a hallway where nothing else would fit. 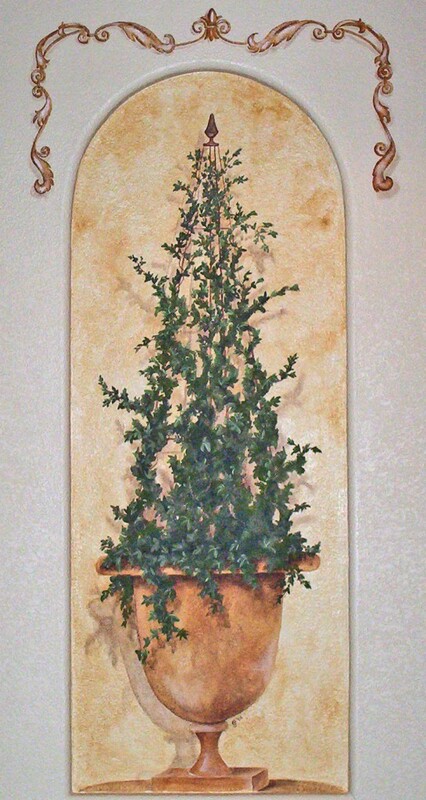 The background was painted to match their floor tile, as is the pot. Here’s the funny thing about this topiary – I was just at their house this past weekend and she now wants a palm tree painted in the niche. So this will get primed out and repainted. Not sure what I’m going to do with the scroll frame, which was painted to go with the architectural arches. They don’t have the original wall color, so I’ll have to put my thinking cap on for this one. So, have a great St. Paddy’s Day! My mom just brought out a green t-shirt for me to wear to aerobics, so no pinchies for me! These are amazing. You really have a lot of talent. I know because I have also done a lot of trompe l’oeil but mine doesn’t look like this. Really well done. Gorgeous as usual; so beautiful in fact, I have something for you. Those are beautiful! Your are very talented! I found you on Life as Lori. You are so talented! Those are beautiful! You’ve painted so much…awesome! I’m sure you can do it pretty fast by now. Thanks for sharing! They are wonderful! Amazing work! I love topiaries…those are all beautiful. Come stop by my Favorite Things Friday Party if you would like to join in! That’s for the look back.. amazing work!